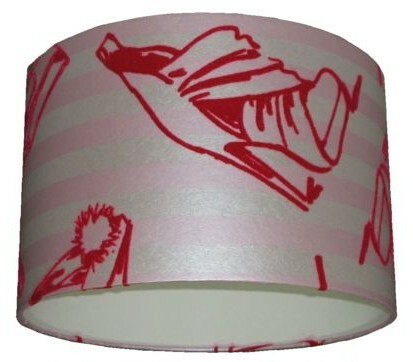 This lampshade is handmade to order using wallpaper from the Barbara Hulanicki collection. A genuine flock wallpaper of shoes on a pale pink and off white striped background. The pattern continues right around the lampshade and top and bottom edges are hand rolled so that the pattern continues beyond the edge. This shade is suitable for a ceiling pendant only with the ring fitting at the top.